Did you ever want a good quality greenhouse? Tired of hauling your wife's plants into the house each fall or tripping over them in the garage all winter? Or perhaps you want to extend your growing season, start plants several months ahead of the season, or just want to experiment with some of our hydroponic gardening systems? Well, this beautiful two-disc DVD and instructional booklet set makes it not only possible - but easy, fun, and cheap. Building a better greenhouse is something that has needed to be done for a long time. Most small greenhouses (also called hobby houses) are either outrageously expensive, or incredibly low quality - sometimes both! But with this plans-and-DVD set you will learn how to build a better greenhouse - a professional-quality greenhouse at a price that can't be matched by anyone. First we lay down professional-grade weedblock for a floor - this is a special plastic fabric that blocks weeds, but allows water to penetrate. Then we take 1-3/8 galvanized tubing - the toprail off of chainlink fence, so you know it's going to last for decades! - and we teach you how to bend this in three places so it's shaped like a house. Then we show you how to build the base and the ends out of treated, 30-year ground contact lumber, and stretch professional quality greenhouse plastic over it - and stretch it without wrinkles. We teach you how to build the door for the greenhouse, install a fan, thermostat, and shutter, where to get all the materials, and how to put them all together. This plans-and-DVD set contains step-by-step instructions showing you every process. You don't need any special skills - if you can use a vise, drill, circular saw, and hammer, you're in business! The key to a top quality greenhouse is top-quality materials. We buy most of our materials from the same place that the huge greenhouse growers do, and that's what makes this greenhouse different. We tell you where you can buy the materials you need locally, or we offer a kit that contains all the items you need - everything except the wood, metal, fan/thermostat, and shutter! The greenhouse structure should last you at least 30 years - I've had one up for over 10 years myself. Periodically - every 4-6 years under normal conditions - you'll need to replace the plastic, but that's a very simple process - one you'll know how to do before you finish the greenhouse - and a very small expense. And the best part of that is, when you're done you have what looks like a new greenhouse - all shiny new plastic for another 4-6 years. And did I mention that this greenhouse is AFFORDABLE? The last greenhouse I built cost me less than $600 including all the materials - that includes the price of our Build-Your-Own Greenhouse Kit and this DVD! The greenhouse in the video is 10' wide and 15' long, but you can easily make it longer, wider, or taller - of those, it's easiest to make it longer. Generally doubling the length only adds about 50% to the price - so it's easy to make a greenhouse large enough for that Ficus that takes up half the front porch! And the best part of all is that you can use this as a small business - for over 12 years now I've been building and installing these greenhouses in my local area, at very competitive prices - and yet at a very good profit, too. 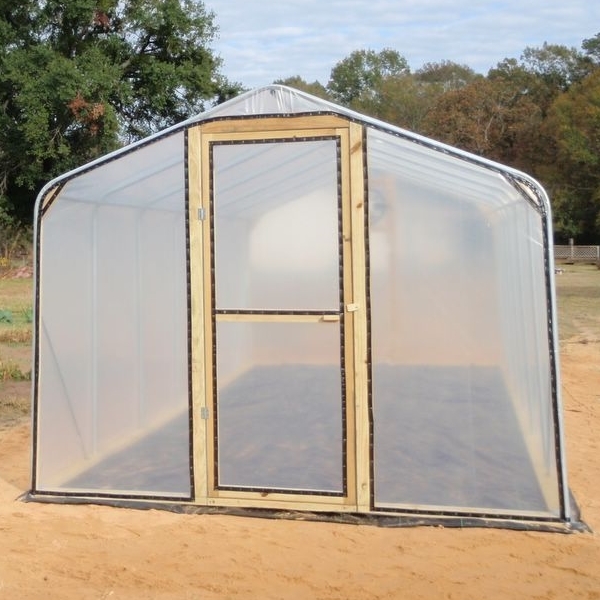 By buying the materials in bulk you can cut your costs down to as little as $400 per greenhouse, and with a suggested MSRP of $999 delivered and installed - a price less than half of any other similarly-sized greenhouse available on the market - you can make a nice side income. Oh, and if you buy the plans/DVD first, then later decide you want to buy the kit from us, we'll refund the full price paid for your plans (less S+H). That way you have no risk and know exactly what you need before you buy the kit! So if you want to have a good greenhouse - a beautiful, upscale greenhouse, one of such high quality that your children can enjoy it years from now - buy this plans and DVD set. We're sure you'll like it - we do. 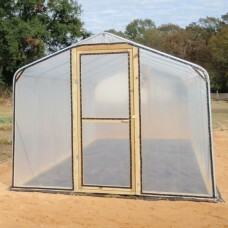 If you live within a few hundred miles of the East Texas area, visit our local website at www.ETexGreenhouse.com and have us build one for you!